Hey, what do you know? Almost 23,000 views. I never did finish the smoother version that goes inside the Oval Office and does a little tour of that…. Apparently, my April Fool’s joke was to forget to change the front page for the month, but I’ve done it now. I’ve chosen a pic of party guests in the China Room in 1958, one of my favorites. I don’t know what to make of this image. 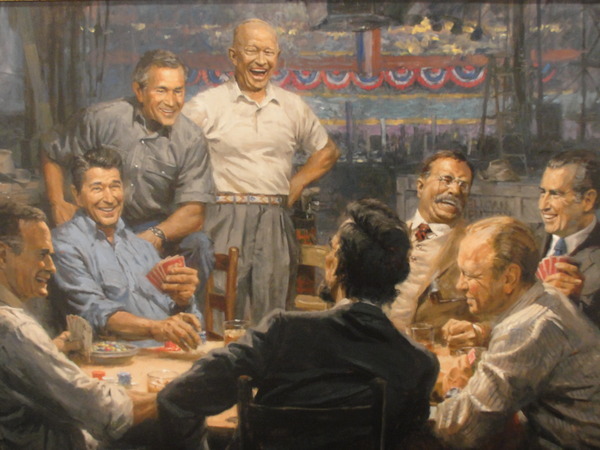 Conceptually, it’s a weird mash-up of the famous Dogs Playing Poker painting and the Boulevard of Broken Dreams painting (dead celebrities in Hopper’s Night Hawks diner). It’s also simultaneously hilarious and vaguely touching. All I know for sure is that Nixon is going to clean the rest of them out. He was a poker fiend. UPDATE: There’s one of Democrats, too! Check out Truman’s shirt!